"The new K�HL RENEGADE STEALTH PANT opposes conventional thought to deliver superior performance, comfort and style. Cut from innovative DURALUX, the durable softshell fabric feels like cotton to the touch. Stronger, more breathable, and boasting superior anti-abrasion and quick dry properties, DURALUX with DWR outperforms standard nylon and provides UPF 50 sun protection. Our FULL FIT features a full seat and thigh for a more relaxed fit. The waistband is lined with soft micro-chamois for unmatched comfort. 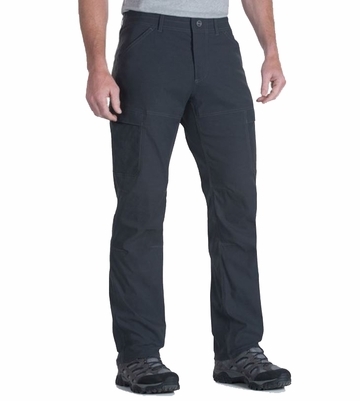 K�HL's articulated knee and gusseted crotch allow true freedom of movement. Stealth compartment pockets inside large cargo pockets keep items secure and organized, while the mesh fabric allows ventilation. Easy care, wash and wear.